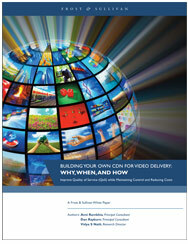 Private CDN for video delivery: Why, When, How. A Frost & Sullivan Whitepaper. Higher quality TV adoption, such as 4K viewing, will strengthen the case for a self-built TV CDN, as increasing bit-rates increase third party CDN service costs and make high quality delivery even more challenging. Frost & Sullivan draws up a list of questions that can help. If you answer “yes” to more than two of these, you should seriously evaluate the option of a self-built or private TV CDN. Do your concurrent viewers routinely exceed 50,000 in number? Is your traffic volume predictable, with few sudden spikes? Is your audience densely packed or geographically concentrated (v/s sparsely scattered across disparate regions)? Is your audience located in regions where commercial CDN traffic costs are high and/or bargaining power is low? Is TVE/OTT a critical part of your viewer engagement strategy? Do you offer on-demand HD and 4K content? To learn more, download the free white paper.